One does not have to have a large glasshouse to grow many plants in it. Take a look at my garden diary for January 26 of last year: “These plants are blooming in the greenhouse: yellow freesias, wax, rex, rhizomatous, Christmas, and cane begonias, scented leaved geraniums (14 species), 17 different ivy geraniums, bryophyllums, azaleas, cyclamen, three amaryllis, gloxinias, rechsteinerias, and 11 different zonale geraniums.” And a little later on March 21: “The Impatiens sultanii plants that were started from seeds sown December 26 are now in full bloom.” All of this in a six by nine foot home greenhouse! During other seasons I’ve had snapdragons, marigolds, ageratums, hibiscus, pansies, violas, azalea and lily seedlings, 13 different oxalis species, growing coleus from seed and every spring we start an abundance of tomatoes, peppers, cabbage, eggplants, and sweet potatoes, to be put in the outdoor garden. Complete prefabricated greenhouses cost much less to buy, erect, equip and operate than the lowest-price car of today. These structures are made of materials that deteriorate very little if they are given proper care – an investment that never stops giving. And the person with a greenhouse rarely becomes tired of his hobby. He may change the emphasis plant and become an authority on many different plant families, but his enthusiasm for glasshouse gardening will not wane in the least. It’s always good weather inside a glasshouse. No worries about a late or early freeze, too much or not enough rain, a wind storm, or an invasion of grasshoppers. If hail storms frequent your section, a roof of corrugated plastic sheeting will give complete protection! Assembling a prefabricated house is as simple as the manufacturers state, and if you do not own the land on which you live, disassembly is just as practicable when you move. Planning one’s own greenhouse can be fun, but there are many pitfalls. Greenhouse manufacturers design their structures so that the roof is pitched to admit the most light; ventilation is good no dead air spaces where plants do not thrive – drip grooves carry off excess condensation, and there are other features that you would not be likely to think of in your design. Build as large as space and your financial means will allow. A structure that can easily have more sections added later is the most practical. Your greenhouse must start with a durable foundation. Various types of foundations are required by different prefabricated greenhouses. In Mid-America, concrete blocks are a wise choice for a durable foundation. Before you do any work, if you are buying a prefab house, secure complete blueprints from the manufacturer, so that your foundation will fit the greenhouse. A lean-to attached to your house is popular if your room is limited. If the structure is detached, away from the house, there will always be trips through rain, snow and wind to see about the plants. And an inspection to see which amaryllis has opened, or which pot of seeds is sprouting will be the first thing on your morning agenda – and if the greenhouse is away from your house, think of the burned toast! A lean-to attached to the house can be mighty handy and enjoyable – easy to heat too, with your existing heating system. If you don’t put plants in every bit of space, this attached lean-to becomes valuable for casual entertaining – an extra living room. 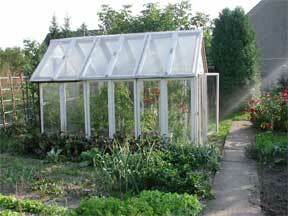 The free standing greenhouse becomes the focal point of your outdoor garden. Light is admitted from all sides and more uniform plant growth is the result. Such a structure is likely to have its own heating system which will probably keep the air more uniformly warm than would be possible in the lean-to heated with existing house heating facilities. Humidity is easier to maintain in the free-standing greenhouse, and when plant pests need to be controlled, there is no worry about injurious fumes entering the house. A thermostatically controlled heating system is a prerequisite here, with an alarm to warn you on a cold night if the stove goes haywire. Unless the heating device is electric, it should be properly vented to carry off all gas fumes. In the South of Mid-America where temperatures are never very low, and if so, are low only for a short time, a small electric heater will do the job inexpensively. Where it is cold, a hot water system with gravity flow or forced flow is ideal, and when properly installed, it is safe and furnishes a gentle heat. My greenhouse is heated with a small bathroom heater which burns propane gas. It was not thermostatically controlled during my first greenhouse gardening years, and many valuable plants were lost. Often we would be away for an entire day – when we left in the morning the outdoor temperature would hover near 20 degrees, and it would be cloudy. So we’d leave the heater on, only to have the sun come out for a clear day, heating up the greenhouse to a blistering temperature of more than a hundred! A thermostat has saved us much worry and many dollars too, although heating has been so inexpensive we’ve never given it any thought. When you locate your structure, be sure the place gets year-round sun. Especially it must not be shaded in the winter when the sun is low in its orbit. If plants are to thrive, they must have fresh air. In the winter, this must be supplied without causing a draft of cold air to strike the plants. Especially in the South, summertime heat can make greenhouse gardening miserable. All the shading material available will not keep the temperature low enough to promote good growth. Besides, such humid heat in deep shade causes plants to grow leggy and rank. This problem is easily solved by installing an evaporative water cooler. Proper shading can be accomplished during the sunniest part of the year by the application of white wash. In the hottest areas it is advisable to remove some panes of glass, or put in screens to allow air circulation. One friend puts all of her plants into a lath house each summer. This leaves the greenhouse empty and easy to get to for a thorough clean-up, fumigation and painting. It is important that the greenhouse be watered when the plants need it. Pipe hot and cold water into the greenhouse, and install a mixing faucet. An icy bath on a cold winter day will do no more for your plants than it would for you.